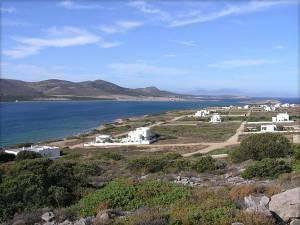 Of late, Antiparos has been attracting quite a bit of attention in its own right as a modern holiday venue. Once considered just a nice one-day excursion for vacationers on Paros, this sweet little gem of an island is quietly capturing the attention of some of the Hollywood jet-setters looking for a “new Mykonos.” While that label can’t yet be applied to Antiparos, there are plenty of reasons for that to happen in the future. The island has some excellent hotels and apartments available, plus some private villas to rent in quiet, less populated areas away from the small main town. The island has excellent beaches at every point of the compass, some with small tavernas, and others just waiting to be discovered. The entire island has a small, friendly feel to it, with a lovely, laidback atmosphere. It’s also within easy reach, as there are small boats departing from Parikia on Paros practically every hour, plus ferries from Pounta, south of Parikia, where the crossing is narrow and takes only 10 minutes. Of course, the main attraction on the island, and one of the most interesting to explore, is the famous cave. It was first discovered during the time of Alexander the Great, and throughout the centuries has attracted visits from a variety of royalty, politicians, and famous artists. The cave is about 90 meters deep, though not all of that is accessible to the public. The magnificent stalactites and stalagmites create a very mysterious and breathtaking atmosphere, and the visit is a must for anyone interested in viewing one of the spectacles of nature. The hotel is situated right at the edge of the harbor combining a quiet, relaxing location with easy access to town. A swimming pool and lovely restaurant area for breakfast and lunch make this a very good choice for a short or long stay. Artemis Hotel is located in the beautiful capital of Antiparos, a small island situated in the heart of the Cycladic Islands, opposite the well-known island of Paros.